Today, Nathan did something special for Ria. He showed her that he could step up onto the swing with minimal assistance…3 times! (Nathan also has cerebral palsy and challenges walking and balancing). A few weeks ago he asked for Ria’s help him climb the same swing. It was necessary for Ria to carry almost his entire weight to get him on the swing. At that time, he couldn’t even hold on and had to be put down almost immediately. This incident shows the power of son-rise and the amazing rate at which a child can accomplish anything…even if the child has neurological limitations. Find the child’s motivation and encourage it. Soon you’ll find his potentials are limitless! Had this been conventional therapy, the therapist would identify targets based on what the “standard” child does. Say for example stand on one foot for 10 seconds or hop on one foot (Nathan still cannot do these). Repetition, not motivation, will be used to try to get Nathan to achieve this target. And of course since Nathan thinks, “what’s in it for me?” He will not exert energy to achieving the goal. After several repetitions, very slow progress will be made, making us feel that maybe my child will never get far. When Nathan was 2 months old, doctors told us he may never walk or he may have learning difficulties. Son-Rise tells us his potentials are limitless! Last week Nathan had another developmental assessment (for the nth time) just to establish baseline (again!) for our new Singapore Neurologist. At the assessment, the Physical Therapist said that Nathan does not look like he has cerebral palsy (limited mobility of legs) at all . She said, “He may be tip-toe walking from sensory or accustomed/patterned walking. But a child with CP wouldn’t be able to do that “…as she pointed to Nathan climbing into a hamper. Nathan also showed-off other skills like walking backwards, with assistance. I didn’t know if I should be upset because I wasn’t confident in her ability to diagnose. I mean Nathan was born premature and needed a respirator in his first 3 days of life. Oxygen deprivation affected the area in his brain responsible for walking. All his doctors and therapists in Japan and the Philippines have confirmed his CP. On the other hand, maybe I should be super excited that Nathan has progressed so much that they cannot detect his CP anymore, other than tip-toe walking??? A few months back, in Japan, Nathan’s Physical Therapist did say it looked like Nathan woke up new muscles after his Son-Rise Program. With more time and constant use it those new muscles, improvements would be inevitable. More proof that son-rise can fix anything neurological! Yes, there is a mountain in front of me, but slowly I shall chip it away until it flattens itself! 1. Give child full control. 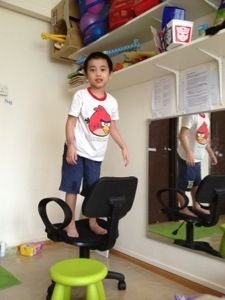 Whenever Nathan wants to climb in table tops, so be it (just ensure safety). By giving full control, the child learns, “I can achieve anything I set my mind on doing.” Many times autistic kids are stopped from doing many things: touching buffet tables, getting some else’s fries, running around, flapping their hands, etc. They aren’t given enough control and encouragement to pursue further. 2. Kids always do things (“isms”) for a reason. If you spend enough time joining them and investigating what it is they enjoy about their “isms”, you will soon discover how those “isms” benefit the child. In Nathan’s case he needs extra sensory input (from climbing and standing on table tops) to help his brain “recognize” his legs and thus improve balance and muscle tone. Nathan has been a bit il for the past few days so we went out for a walk as soon as he was up to it. His posture is so much better. In this video he is more mindful about where he steps. Even if there are breaks on the ground, he manages pretty well. It’s a little hard working on Nathan’s son-rise program when his twin sister and younger brother are home, like on Saturdays. So today I decided to take Nathan out for a walk. 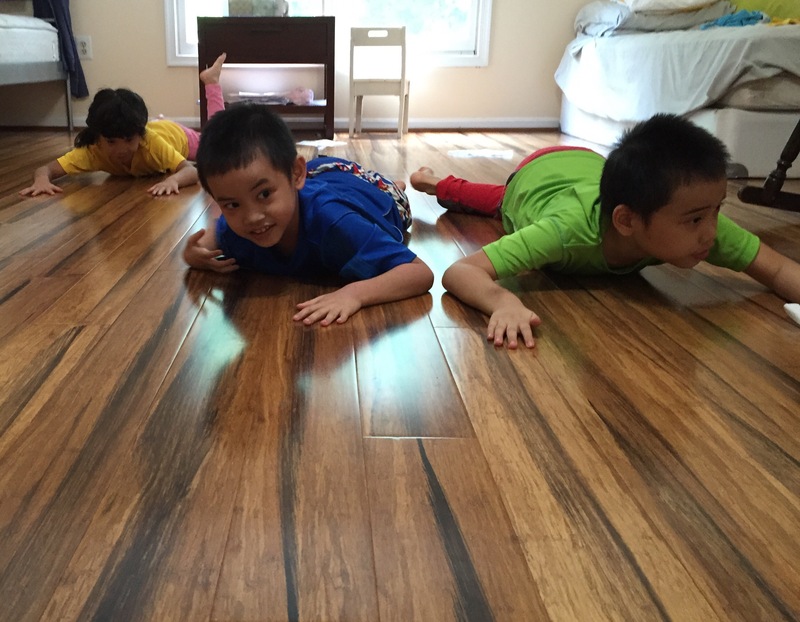 A full-time son-rise program would recommend that the child stays in the son-rise program playroom all the time. The room is designed specifically to remove all distractions so that the child’s focus will remain on the son-rise facilitator. A conducive environment can help enhance the growth of the child. True enough, Nathan performs his best in his son-rise room. These are some of the reasons why it is not the best idea to bring an autistic child out…but I’ll consider this a break and exercise for both of us. 1. Nathan has to pass by all the fire extinguishers on the way out. It doesn’t matter what I say, or even that I am around, as long as he gets to touch the attention-grabbing fire extinguishers. 2. If I had Nathan’s attention, he could easily read “FIRE” and a lot of other words but the red color just really catches his attention. Watch the video. 3. I guess the outdoors is a great way to stimulate the senses. Just feel the cold breeze on your face, the spikes on the bushes, the bounce as you put your weight on the bushes, the texture of the grass, the heat from wearing a bonnet in the spring 🙂 . With all that sensory input, who would want to listen to Mommy? 4. It wouldn’t matter if that video was 4 minutes or 30 minutes long. Nathan will find something to “ism” away with and ignore me. In the end, I had to carry him to the front of our building and encourage him to walk home. 5. Of course, on the way back, we have to pass through the fire extinguishers again! This video seems ordinary. Even a 3-year-old can do this. But Nathan has cerebral palsy and autism. When he was dismissed from the Neonatal Intensive Care Unit, the doctor said he may not be able to walk. But today, he decides to challenge his balance, not only by standing on a swivel chair but also by twisting it with his lower limbs. 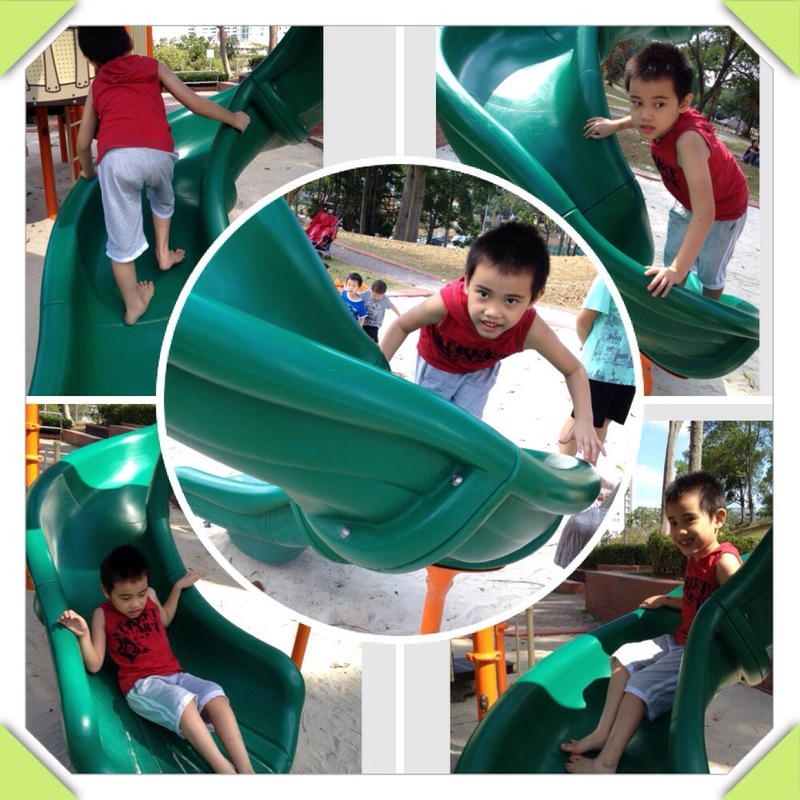 All his excitement and energy to do things on his own is coming as he progresses in his son-rise program for his autism. Nathan has always loved music and instruments. Now, he’s starting to show interest in the people behind the instruments. Watch how he touches the pianist’s face. He also verbalizes his wants more. After drumming with his hands, he asked for drum sticks (I didn’t get that in the video). What was amazing was he resisted mouthing the drum sticks. His drum sticks at home are filled with bite marks. I guess this is were joining his mouthing “ism” is now paying off. Watch also how he gets excited at he goes for the lady’s face.